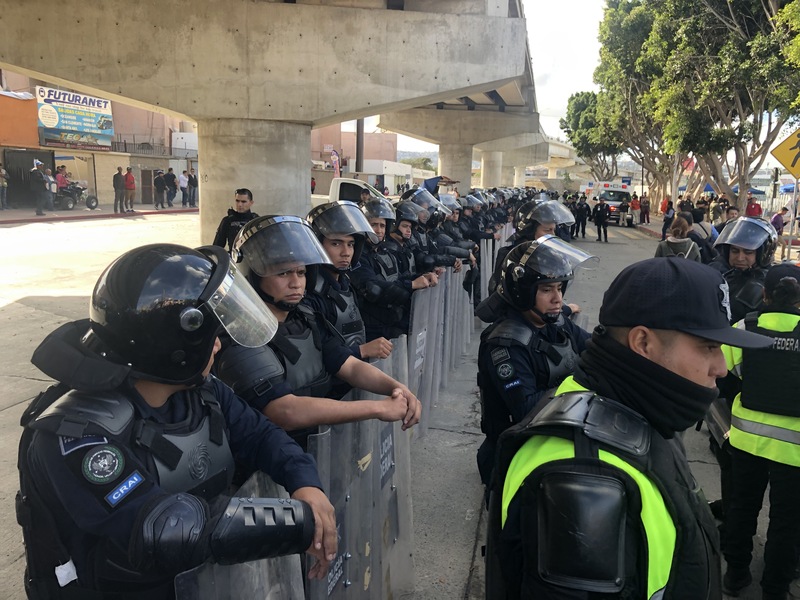 I walked over the bridge at the San Ysidro border crossing in the middle of a group of about two hundred aslyum seekers from the refugee camp at the Juan Cabrillo center about a mile away. They’d been organizing this direct political action for days. Frustrated, sick, some hungry others who had just arrived, still exhausted from the journey. A couple hundred cops in riot gear for the perfunctory photo op, as corporate news crews pushed and shoved their way to the front for the money shot. 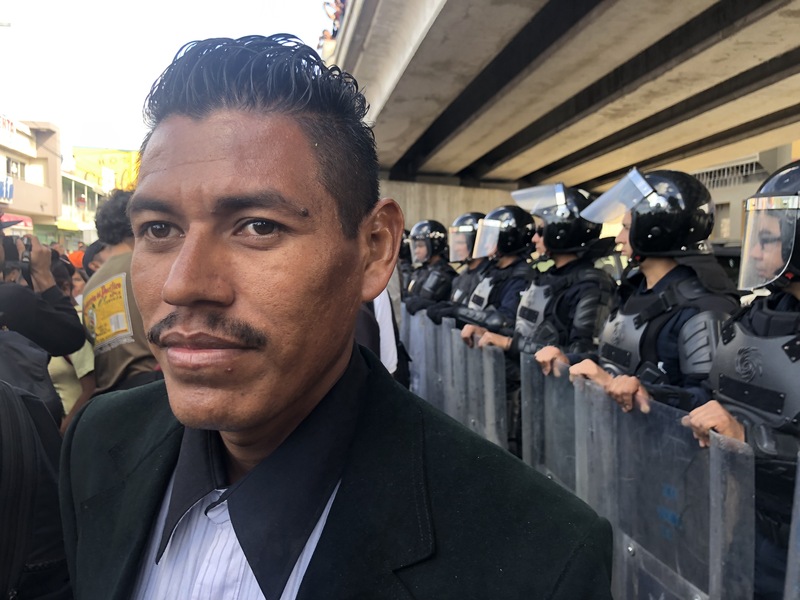 It’s been a week since a group of hopeful Hondurans let me tag along on their bus ride. The spark of hope they brought has diminished since another thousand people poured into the camp and the hate from local media flowed, but somehow there are still smiles, even though another eight thousand are on their way. The camp ran out of baby formula today. Media outlets are reproducing false reports of drugs, violence, people refusing food that doesn’t suit their palette, refusal to work and other blatant lies. I’ve been here the whole time. The stories are not true, but that doesn’t seem to concern reporters on the job. What is true is that the camp is toxic. It rained this morning and made matters worse. The Mexican government is posturing; a kitchen with the same food on the shelves for a week is a favorite photo for the papers. A very well lit medical tent outside of the compound in the street is big hit with the journalists too. No one bothered to ask why it’s outside, if the people who need the services are inside. 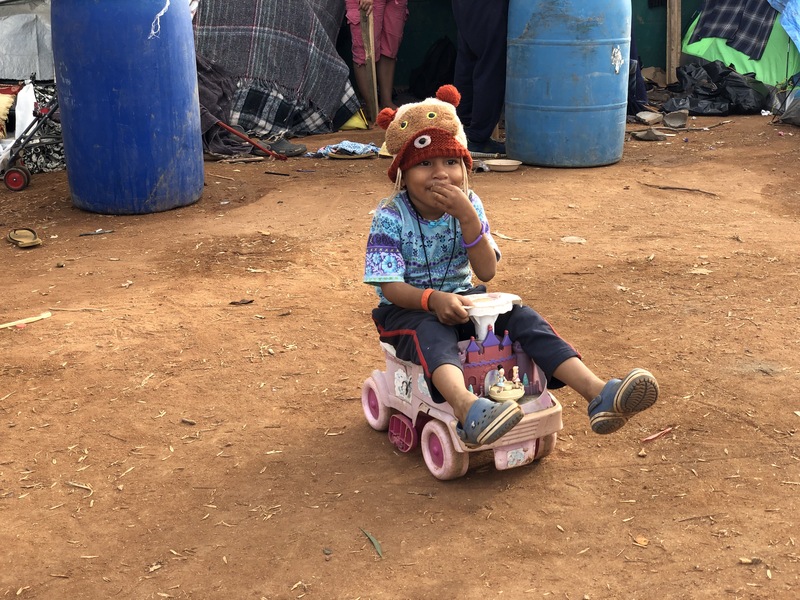 Other favorites are smiling children, mothers and happy, but tired Hondurans, Salvadorians and Guatemalan refugees sleeping in wrinkled clothes, sardiene-canned and hacking up phlegm because everyone sick. The people in this camp have figured out that the people with the big cameras and audio gear are perpetuating lies about them. 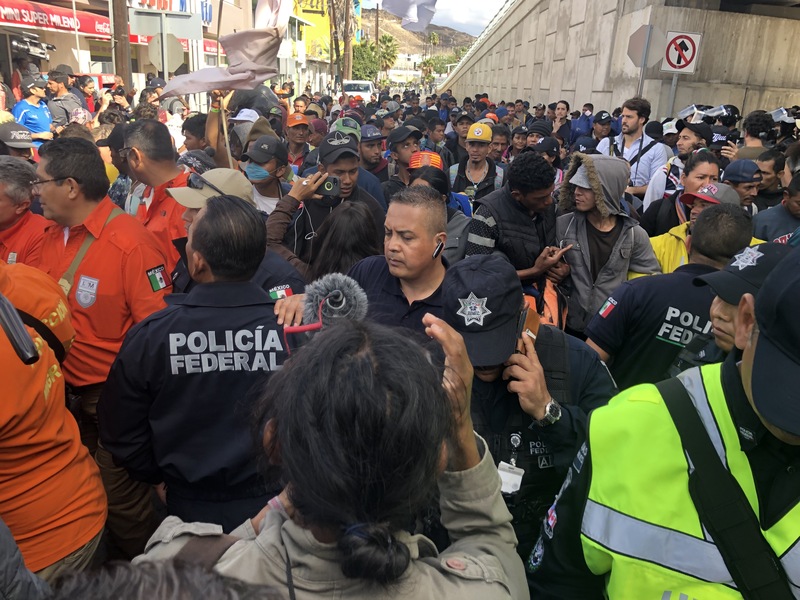 They don’t seem like the type of people who would confront them directly and I don’t anticipate a march to the Tijuana Marriot. You’d need some taxi money for that protest, besides they all have paid “attendents”. Two days ago a 17 year-old boy was killed in a hit and run. Down the block three people were killed in a gun fight the next night. Traffickers show up daily and look for prey. I streamed a kidnapping a few days ago just after I watched a man die in the street because he couldn’t get his medicine. I also met a woman with her son who has Down syndrome. Maria Luisa Cardenas said 15 year-old Javier Antonio was vomiting blood because he had the wrong medication. I’ll post a live stream I did of them with documentary photographer, Ada Trillo tomorrow. I’m sure that would have been a big hit in the AP photo pool, but like a lot of others in the camp they have vanished. Maybe they got help. No turkey here. Just wet blankets and mounting desperation. Happy Indigenous people’s day!